My very first post about a mudroom – albeit one that is in essence another bathroom. 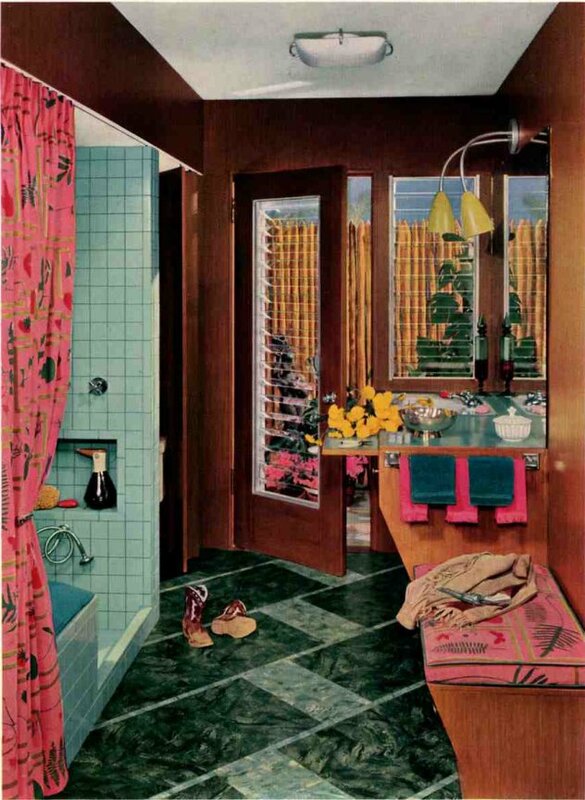 Notice the sink next to the door, and the hand held shower to the left. 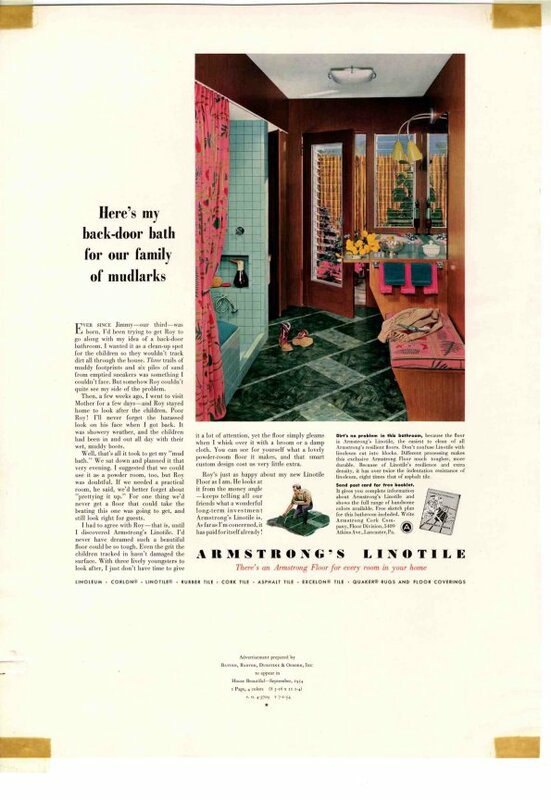 This is another fabulous design from Armstrong Floors, circa 1954, from my private stash from Batten, Barton, Durstine & Osborn, Inc. (insert forefinger into mouth, make popping sound.) Look at the text of ad, and it talks about the “family of mudlarks.” How cute. These colors are fabulous, don’t you agree? Come on retro renovators, saturate that house with color! 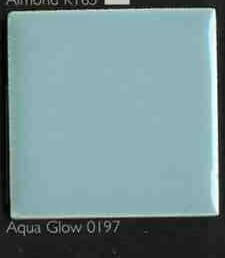 Daltile now has aqua tile. The floor, we can find something close, the laminate – aqua boomerang. You can replicate this room in a breeze, and everytime you walk in the back door – you will be in retro heaven. I really like this room. The aqua and hot pink color combo is, to me, very pleasing. I especially love the fabric in the shower curtain and bench cushion. And look at that ceiling light fixture—I don’t think I’ve ever seen one quite like it. Even as a kid, I loved the look of jalousie windows. My aunt had them in the breezeway between the garage and house. Out here in the Midwest they have “Florida rooms” that are enclosed porches with these louvered jalousie windows. However, they are notorious energy-wasters, and I think they aren’t up to housing code stipulations in most places. Too bad, because I love their midcentury modern horizontal look. Tell me, is that a tiled seat in the shower? A shower in the mudroom — brilliant!! That would make gardening and dog washing so much easier.